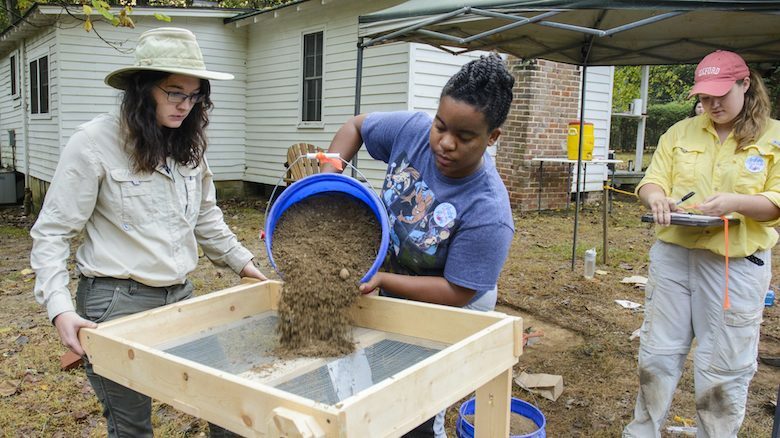 University of Mississippi archaeology students will get a chance to share their field work with the community when they host a Public Archaeology Day on Saturday (Nov. 10) at Rowan Oak. Free and open to all ages, the Public Archaeology Day event is set for 10 a.m. to 3 p.m. Rowan Oak, home of American literary giant William Faulkner, is off Old Taylor Road in Oxford. Visitors can expect to see some of the artifacts the class has discovered on the property, as well as learn about the different methods for surveys and shovel tests used by Ole Miss archaeologists. Tony Boudreaux, director of the Center for Archaeological Research and an associate professor of anthropology, teaches the class hosting this event. The class has been working at Rowan Oak to learn more about the pre-Civil War period, Boudreaux said. Students in the class say this work is particularly meaningful because most existing information regarding Rowan Oak pertains only to when Faulkner owned the home and property. “Many aspects of archaeology are not pretty, but they are meaningful,” said Arianna Kitchens, a sophomore anthropology major from Collins. Also a member of the Sally McDonnell Barksdale Honors College, she plans to use the work at Rowan Oak for her honors thesis. Faulkner bought the home and property in the 1930s, but this land was initially settled in the mid-1800s by a slaveholder named Robert Sheegog. “We hope to build on the already existing narrative of life at Rowan Oak to include the story of Robert Sheegog and his slaves,” Kitchens said. Students and teachers alike are excited for the opportunity this event presents. “The Public Archaeology Day is a great opportunity to share our research in an educational format,” said Hannah Rhodes, a master’s student in anthropology from Knoxville, Tennessee, who is specializing in archaeology.